our garden and this was the perfect recipe to make use of it. 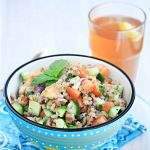 Tabbouleh is a very famous Arab Salad traditionally made of bulgur wheat. 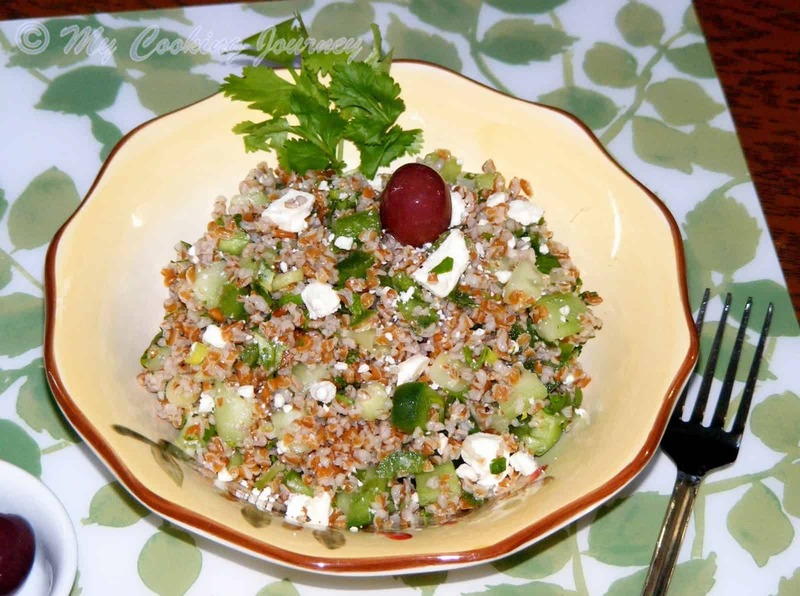 Today I am replacing the bulgur wheat with Quinoa, a tiny super grain (ok got it wrong, it is a seed and not a grain), which is loaded with protein. This could make as a wonderful Vegetarian main course or a summery side salad. 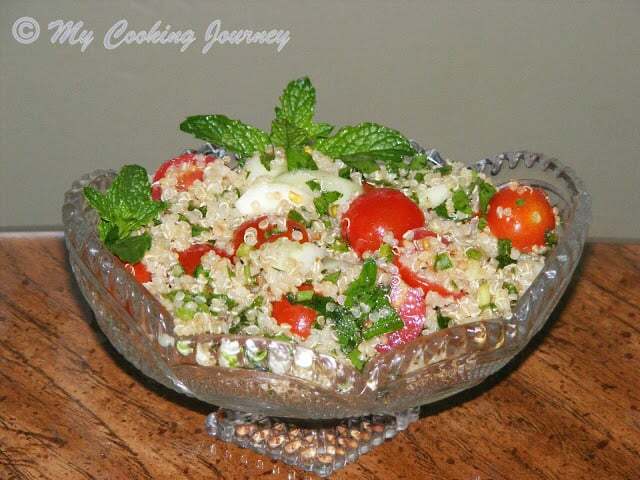 We have eaten this tabbouleh many times in our local Middle Eastern restaurant. I like to eat it stuffed inside my pita along with the falafel and hummus. Also in this workshop he introduced us to several whole grains spelt and faro. 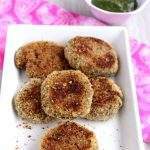 They tasted amazing when cooked. 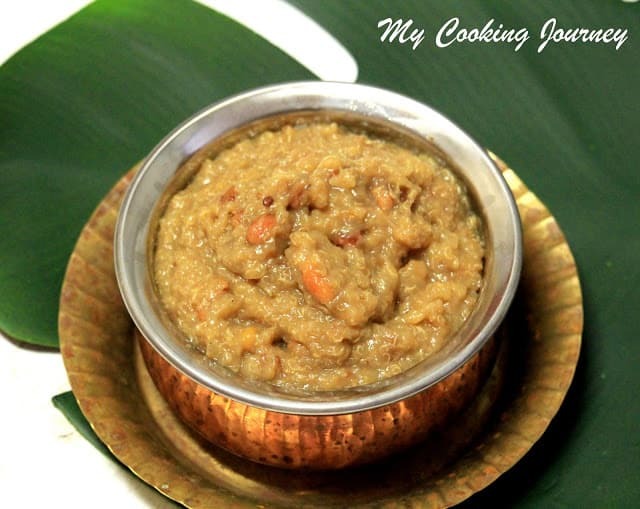 He had also made us a wonderful steel cut oatmeal porridge that was amazing. Wash and rinse the quinoa couple of times. Drain the water. 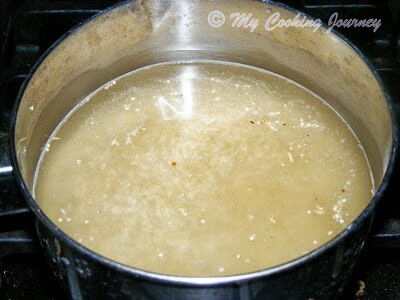 In a sauce pan, bring quinoa, ½ tsp salt and 1 ¼ cups of water to a boil. 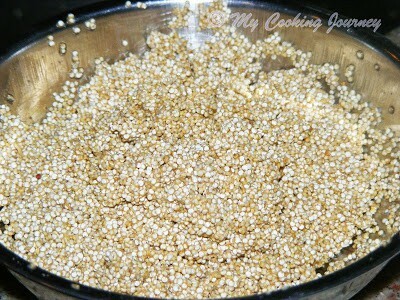 Reduce the heat, cover and cook the quinoa until it is tender (could take about 10-12 mins). Remove from heat, let it stand for 5 more minutes and then fluff with fork and allow it cool down. 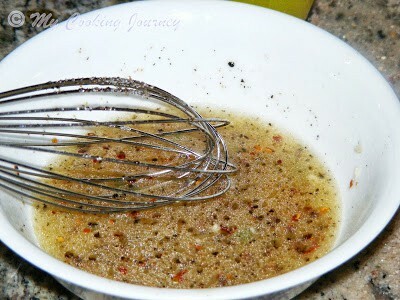 Meanwhile to make the dressing, whisk the lemon juice and garlic in a small bowl. Gradually whisk in the olive oil. Season the dressing with salt and pepper. 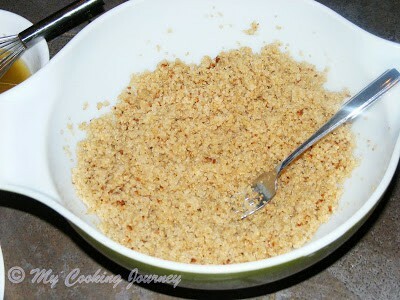 Transfer the quinoa to a wide bowl. 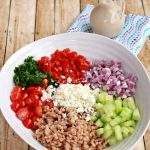 Mix in ¼ cup of the dressing. 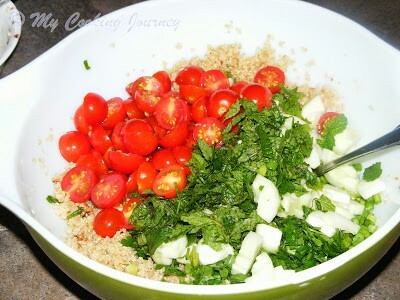 Now add the tomatoes, cucumber, scallion, parsley and mint leaves to the quinoa. Toss to coat. Season with salt and pepper and add the remaining dressing. Mix well and chill at least for an hour. 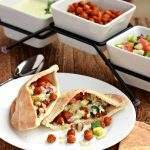 Serve with pita and hummus or as a salad or as a main course. 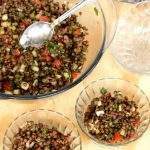 If you are planning to make this salad for a party, you could cook the quinoa, cool it and add ¼ cup of dressing and refrigerate it a day ahead. Then when ready to assemble, just add the rest of the vegetables, herbs and the remaining dressing and toss. same pinch again Sandhya!!! 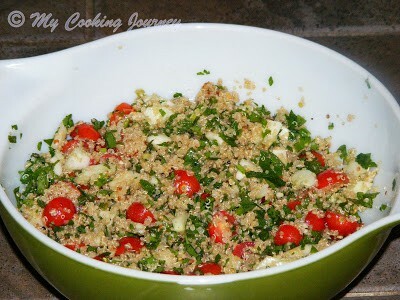 I also did Quinoa Tabbouleh!! so refreshing and so delicious!! That's a healthy and delicious salad in that bowl. That's great to harvest and use your own cherry tomatoes. 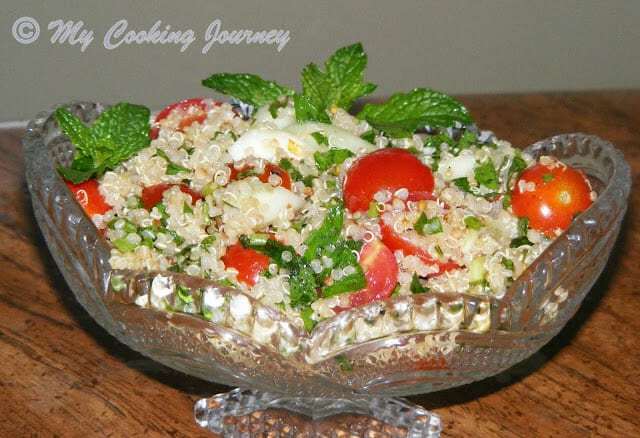 These are very costly here ..
Wat an inviting and nutritious tabbouleh, i can have a huge bowl. 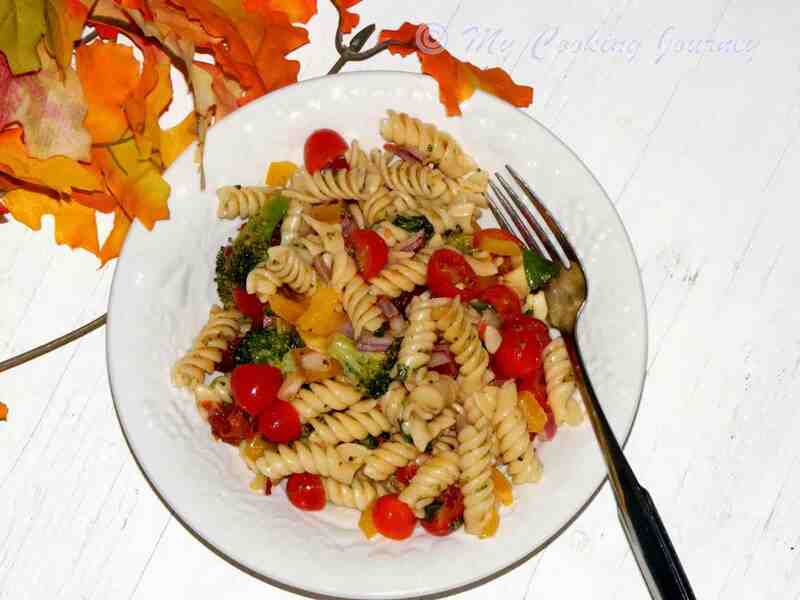 Love salads and this sure is a hit with the family…looks great and those cherry tomatoes look so cute. Wow I am envious now u r able to enjoy everything fresh right from ur garden lucky u sandhya. 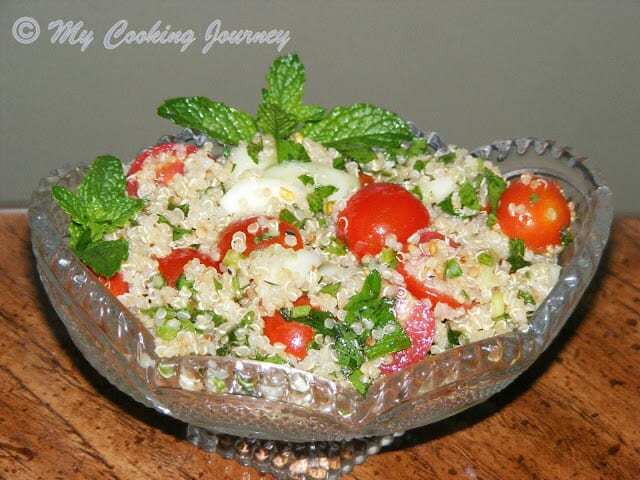 I love quinoa and this is such a healthy & filling salad. 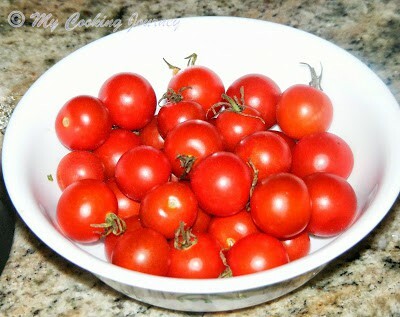 Love your tiny tomatoes — plump & fresh.. Very colourful salad. I must search for quiona now. 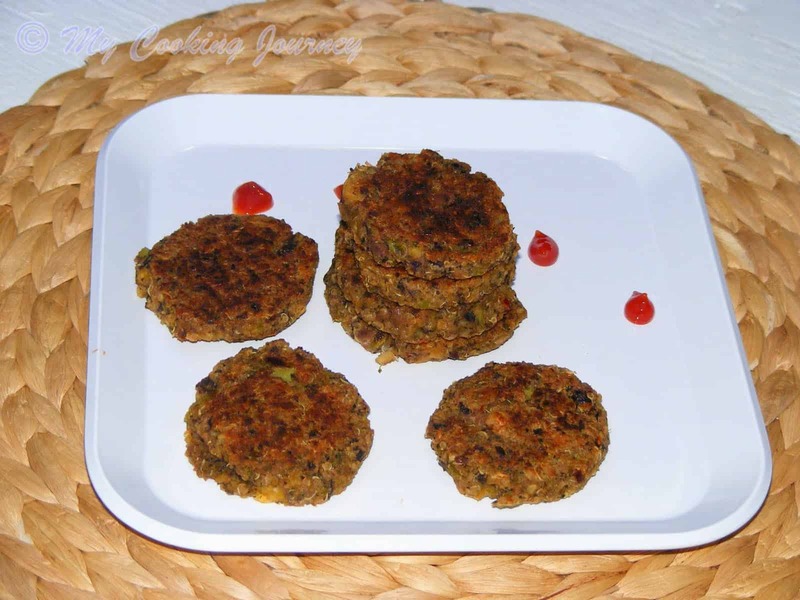 wow..looks inviting n healthy dish…nice presentation..